When you take an opioid pill for that painful back, your entire central nervous system mellows. Many people become addicted to that feeling or suffer other side effects. 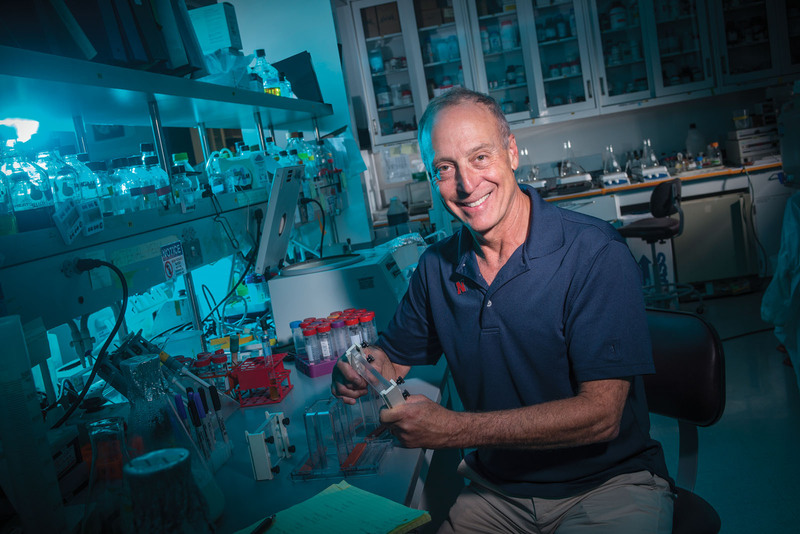 To help blunt the opioid crisis and help millions of pain sufferers, Nebraska biologist Paul Blum and his team created a drug that targets pain at its source, leaving the rest of the nervous system, including the brain, alone. Blum and former doctoral student Benjamin Pavlik co-founded Neurocarrus, a biotechnology startup company, to develop the drug, called N-001. Paul Blum holds a protein gel apparatus used to analyze proteins. Blum studies proteins. His team’s breakthrough came when they looked at Clostridium botulinum. These bacteria produce toxins used in medical procedures, such as wrinkle-reducing Botox injections, to freeze motor neurons and paralyze muscles. Instead of motor neurons, Blum’s team investigated ways to essentially freeze sensory neurons, the nerve cells where pain originates. They developed a multifunctional protein that enters sensory neurons and blocks their signals from traveling to the brain, where pain is perceived. N-001 works via a localized injection or topical cream. In animal studies, pain relief lasted three days, three times longer than with opioids. Neurocarrus has a licensing agreement with NUtech Ventures, the university’s technology commercialization arm. Domestic and foreign patents are pending for N-001. The company received seed money and entrepreneurial training from IndieBio, a biotech startup incubator in San Francisco. It also won a challenge grant from the National Institutes of Health’s National Institute on Drug Abuse for N-001’s potential to reduce substance abuse. Blum said he hopes to begin U.S. Food and Drug Administration-approved testing in humans by the end of 2019. First, the company must entice venture capitalists to invest in clinical trials.